…when you leave your busy, your worry, and your hurry behind. There are things you notice when you look forward. Free of expectation, life has a way of lifting secret curtains. A thousand times. I must have stepped out of my dwelling a thousand times. Yet tonight, for a brief miniature walk, I noticed things. New things. I noticed a castle across the way. A drawbridge. A moat. And in that moat was a bonsai tree with a most peculiar branch extending like an eager hand reaching for land. I noticed a boutique. And in this boutique, was either the smartest or the laziest mannequin I have ever known. For this mannequin did not stand on her two feet. Oh no, this mannequin sat its plaster keister on a chair. That’s right, a sitting mannequin. Genius. Who knew? I didn’t. But I do now. FYI: The new url cravewriting.com is now active and will directly link here. Therefore, you no longer have to type ‘wordpress.com.’ Instead simply use cravewriting.com to access the site! Happy Anniversary of Theodor Seuss Giesel’s Birth! With more written about Dr. Seuss than his 60 plus books themselves, I’ll refrain from failing at penning an earth-shattering composition about the best selling children’s writer of all time. Instead, here’s a random assortment of tidbitz and linkadoodles. In regards to branding and carrying a similar tone through one’s portfolio, I would have to say that Gary Larson is the comic strip industry’s Dr. Seuss. Dr. Seuss’s first book, “And to Think That I saw It on Mulberry Street” was rejected 27 times before it was published. Keep sending until you can pass 27, so then when you become famous, people can reference how you were rejected ?? times to motivate aspiring writers. Dr. Seuss published his first children’s book at the age of 34. Since I turn 30 next week, I’ve got 4 years! I’m too scared to consider how it will take 2-3 years beyond acceptance for the book to be technically published. Oh boy, I better get sending! Awards are great…for the winners. Just remember if you come out on the losing end that Dr. Seuss has never won a Caldecott or Newbury Medal. Though three of his books were runners-up. It’s not a coincidence that March 2nd, Dr. Seuss’s birthday, is National Read Across America Day. Seussy is listed in Urban Dictionary as an adjective that is characterized by or possessing qualities similar to the works ofDr.Seuss. February has closed its curtain and the Picture Book Marathon has ended. Hopefully all of you imaginators out there successfully crossed the finish line. If not, you can always extend your marathon into March and wrap up the loose drafts. Having finished four days early, this year’s marathon feels less of a monumental task and more of a useful writing exercise. While, according to PBM officials, each marathoner was to complete 1 manuscript per day with 2 days reserved for rest and recuperation. Eager to finish before a lengthy business trip to Tokyo, I opted for a sprint. Luckily, thanks to my ever-increasing writing endurance, on February 12th and February 24th I was able to pen 4 manuscripts. In fact, out of the 26 days, only on 4 days did I pen just one manuscript. It’s not that I carelessly rushed my way through each 500 to 1,000 word draft, but rather I’ve used my experience and resources to make use of the time. For instance, my desk job is simply that, for 75% I’m regulated at said location free to listen to music, surf the net, or in my case, write picture books. In addition, several of the pieces had been ideas crawling out of the boxes in my attic. So naturally with loose outlines and page turns penciled in various journals, I found it easier to dust them off and pen them to life. Each manuscript has been dated, attached to a storyboard blueprint and a status sheet, and firmly placed into a clear plastic sleeve in the holy 2011 PBM Binder. Will I reference this holy resource in the future? Of course, but then again, there will be a few pieces left to rot until I can gather up the resources necessary to afford the plastic surgery. 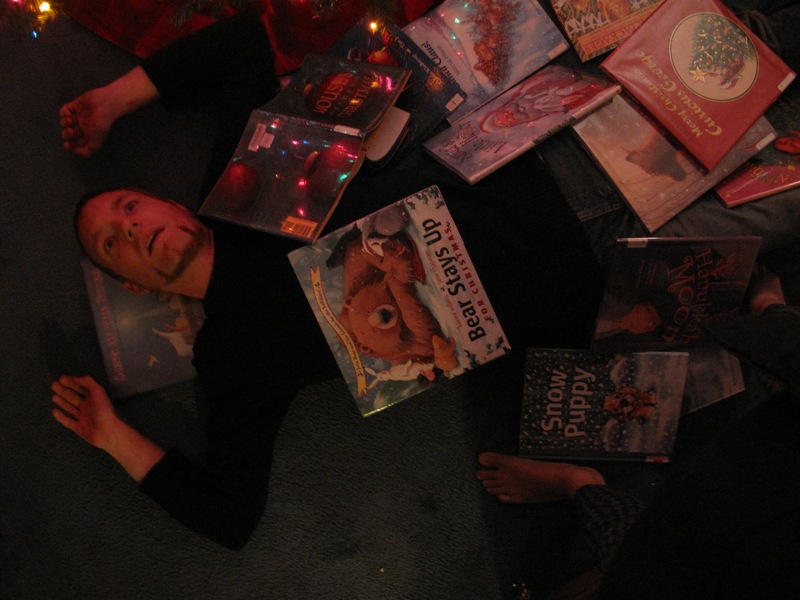 I’m already looking forward to next year’s picture book marathon. In the meantime, I plan to send out 1 picture book as well as write 2-4 new manuscripts per month. To see a list of manuscripts #1-22, plese see the previous PBM weekly posts. Below are the final manuscripts of this year’s picture book marathon. 23.) Father Goose Tries To Tell a Tale: Father Goose tires of being shushed at storytime and puts his beak to the rhyming test. 24.) Unless: A Guide to What Kids Don’t Like: A list of things kids don’t like remixed into things they will love. For instance, kids don’t like cavities…unless faeries bury their shiny treasure there. 26.) Wild Bowl: In a small African village, young Dede is presented a football which he views as a wounded warrior who joins him in battle with wild animals on the field of battle.